If you anticipate to collaborate your content with any of your external vendors, clients or external partners, SharePoint online has feature called External Sharing. 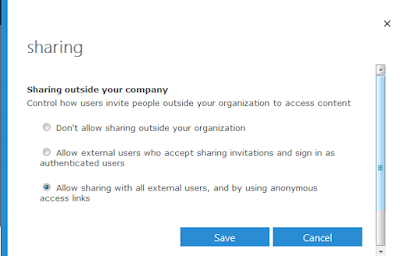 To achieve External Sharing, the first step as a SharePoint Online Administrator is to turn on external sharing. By turning on this feature, users outside of your organization can be invited to SharePoint Online to view or edit your document, list or site page. You must be a SharePoint Online admin to configure external sharing for individual site collections. Site collection administrators are not allowed to change external sharing configurations. 1. Go to Office 365 Admin portal. 2. In the left side navigation, expand Admin and click SharePoint to connect the SharePoint online admin center. 3. Click site collections, and check the box next to site collection that you want enable external sharing. 4. In the ribbon, click Sharing action. 5. Now, check on of the sharing option and click Save button. That's all, now you can share any sites and documents under this site collection with external users.